Goot van der, Herman Cornelis. Graaf van de, Leendert J.
Hoeven van der , P.
Noordt van der, Jan Willem. Sluys van der, Johan Willem. Zee van der, Herman Coene. Captain Frank van der Hoeven. Obdam of 1889 . Bad weather, Mutiny and sick soldiers. The First ever Mass market Cruise Ship. Photo gallery: Faces of the Engine Department. Photo gallery: Faces of the Veendam Deck Dept. 08 December 2018: Malaga, Spain. Sailing into Malaga is one of the easier approaches in the Mediterranean. There is a wide entrance and you just follow the long break water in. The inner basin is wide as well as the port is sort of horse shoe shaped. The cruise terminals are on the starboard side, along the Eastern Breakwater. The cargo piers are mainly on the west side and the Marina and ferry docks at the top of the horse shoe close to the city itself. Although the city is not on top of the port as such. Some time ago I walked it once from this terminal and it was a good 20 minutes before I reached the first signs of civilization. (=Read Shops) I emphasize” from this terminal” as there are more and the last berth on the breakwater is another 10 minute walk from here. The port of Malaga (Thank you Google Earth) the cruise ship in the photo is at the same dock we were at. And then the whole long breakwater pier is used for more cruise ships if needed. We were at the best terminal and closest to the city. Whether that was because we are new or because we are the biggest one in port I do not know, but here we are. Behind us was the Mein Schiff 2, which is one of the older Celebrity ships from the 1990’s. TUI which is the owner is part of Royal Caribbean and so is Celebrity and they have also used the system of pushing their older tonnage to 3 star emerging markets. That German emerging TUI market has exploded in the meantime and Tui / Mein Schiff is together with Aida a major player in the German market, is so successful that they have been building new ships. These are also called Mein Schiff and with the same numbering. That makes it a bit confusing as with one number going out another number is coming in. On the other hand, Holland America is also quite good at it, with repeating the glorious names from the past. If we forget the word “Nieuw” for the moment, then we are now talking about Statendam nbr 6. (1898 Statendam, 1913 Statendam/Justicia, 1929 Statendam, 1957 Statendam, 1992 Statendam) Not much different than Mein Schiff 5, although I like a real name much better. That Statendam name, is also a matter of deep discussion, as where is it coming from ? 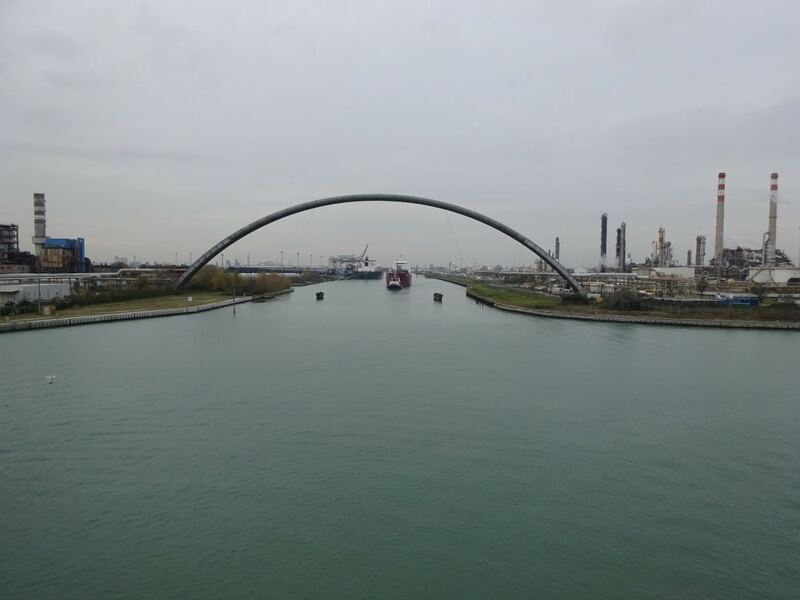 There is no city in the Netherlands with the name Statendam or a river with a name of “staten” or something similar. Also the HAL archives in Rotterdam are deadly silent. There is hardly anything in there about naming of ships at all, although the Board must have discussed these things. Theory one: The Statendam was / is named after Staten Island in New York, to keep the balance between Dutch and American names. Theory two: the ship was named after The Hague, were we have the “Staten Generaal” which is the Dutch Parliament. 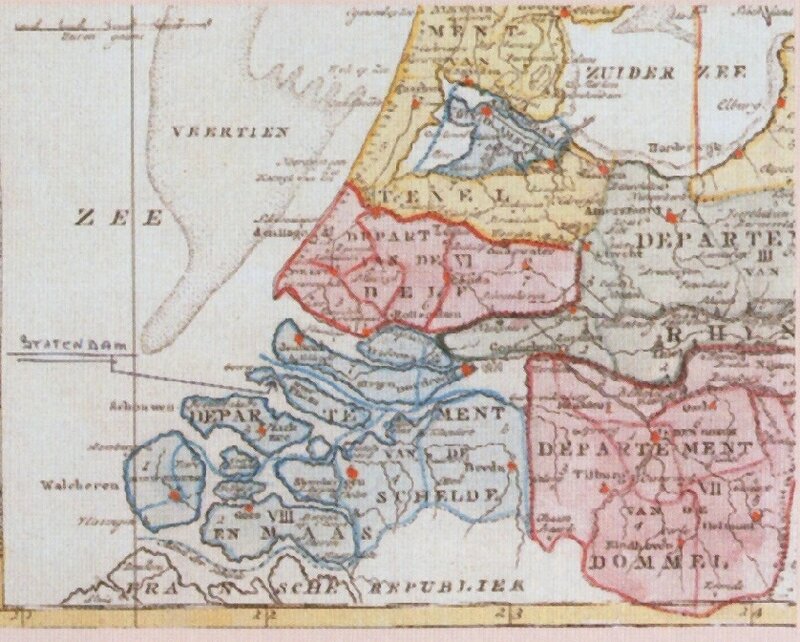 Theory three: named after a Dam which connected the islands of Goree and Overflakkee in the Netherlands, south of Rotterdam. …………….. Sounds all very nice, but no proof……………………. 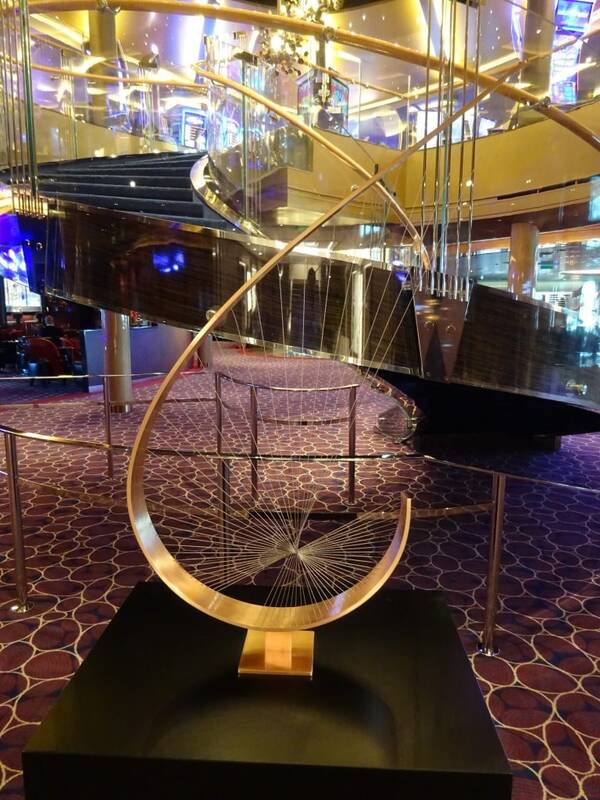 And now we have the “Nieuw” Statendam a name chosen to lay a link between our heritage = Statendam and to indicate that Holland America has chosen new directions in what it offers our guests; as is clearly visible in what we offer here on board the ship. Food options, entertainment options, Music Walk, etc. etc. Also here there is a connection to a previous Statendam. When Holland America went full time cruising in the 70’s, the Statendam IV was the first one to be converted for cruising and the first one to carry the new house colors. The three waves especially chosen to show the world that: “Holland America was going to make waves in the Cruise Industry”. 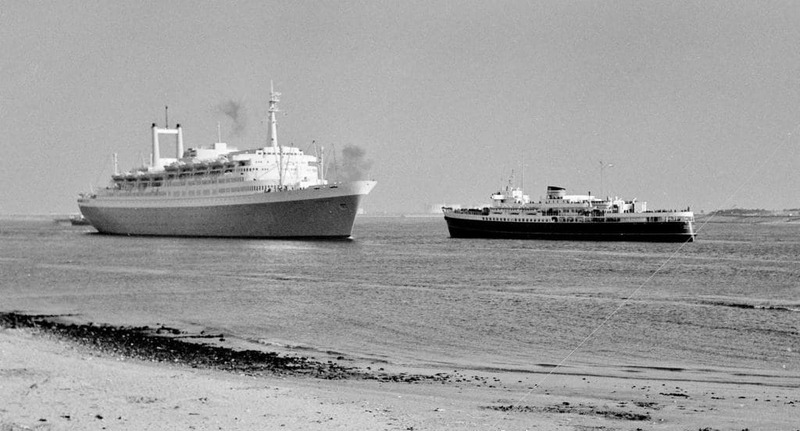 And that we did as also in the early 70’s the new ideas of the company had a major impact on the cruise industry. Christmas trees on the Nieuw Statendam. 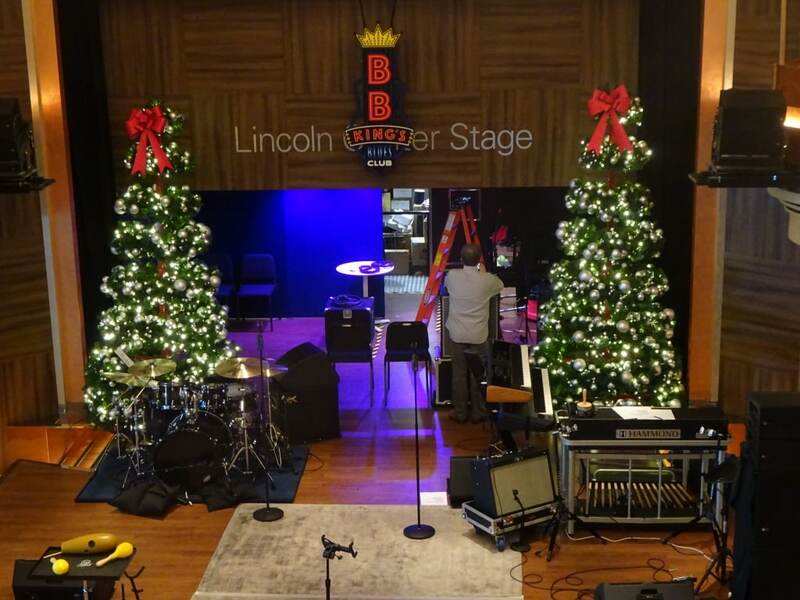 It looks that they are setting up for the BB King rehearsal. For those who are wondering if the Nieuw Statendam is also gearing up for Christmas, these are the Christmas trees in the BB King Jazz Blues Club. The doors to back stage are open giving a rare view to what goes on behind the scenes. Slowly but steadily there is more decoration coming but it takes time as it is a big ship and we only have two florists. From Malaga we sail directly westwards to the Straits of Gibraltar and the Rock, which we hope to pass around 21.30 hrs. Then it is a straight course for a point south of Funchal. We had glorious weather today and that is set to continue. A little bit cooler as we are in the open seas but I hope for high fifties / around 15oC in European speak and not much movement. The surf forecast gives nothing over 10 feet, so things are looking good for our first part of the North Atlantic crossing. Ps. a thank you to the readers who wrote a reaction to the “big sailing boat” picture I published yesterday; now we know what it is. It is called “A”; and that raises the question, is using letters from the alphabet similar or different then using numbers to name a ship???? 07 Dec. 2018; Cartagena, Spain. This Cartagena in Spain gave the name to Cartagena in Colombia during the days of the Spanish expansion into South America. Cartagena itself comes from Carthage, the once mighty City State across the sea which made the life of the Romans very difficult until they destroyed it. The great roman general, Scipio Africanus then renamed the place in Carthago Nova and eventually it became Cartagena. That is what I remember from my school days. More can be found no doubt on the internet. We followed today in Scipio’s footsteps and sailed into Cartagena Bay at 06.30 hrs. This port is a favorite for many captains as it is so nice and sheltered. The break water keeps the swell out and the surrounding mountains are quite good at keeping the wind out. Both things they did today although there was not much wind out there to start with. We had a beautiful Spanish autumn day. We were also the only cruise ship in port and that made it even better. Cartagena as per Google Earth. (Thank you) We are docked at the inner L shaped pier. And there is this large East /West Breakwater which keeps the swell out. Cartagena is not only a cruise port, it has a large marina located inside the Cruise pier, and there is also a large naval presence and a shipyard which specializes in expensive yachts. There was one under construction right in front of our bow and I suppose it had to resemble a sailing ship but the hull was clearly constructed for a lot of luxury. Not my taste but if you have money to throw away at such things then why not, it supports the economy of Cartagena. I always consider owning a boat as if being married to two women; and the boat is often the more expensive one. I cannot afford to maintain two wives let alone deal with two mother-in-law’s, so I rent a boat if I feel the need. 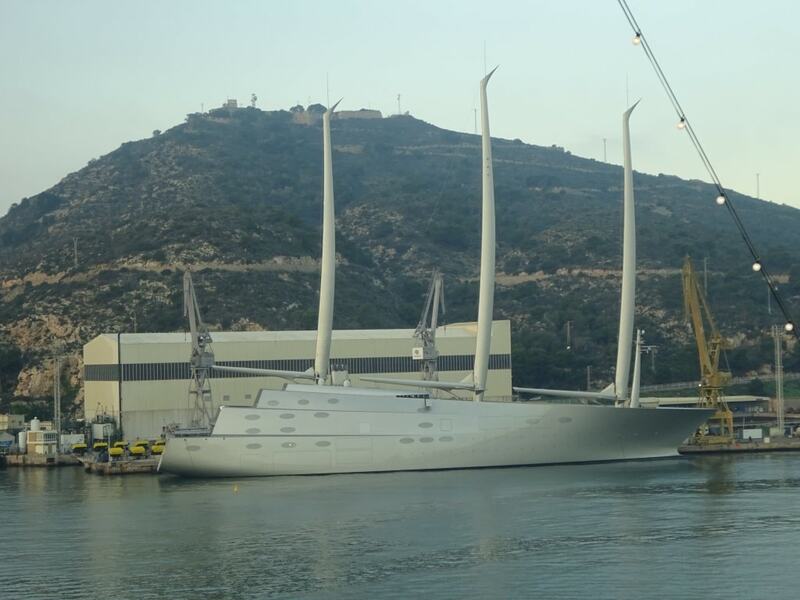 I am not an expert in Sailing and motor yachts but I doubt if you can buy this one for under $ 50 mln. 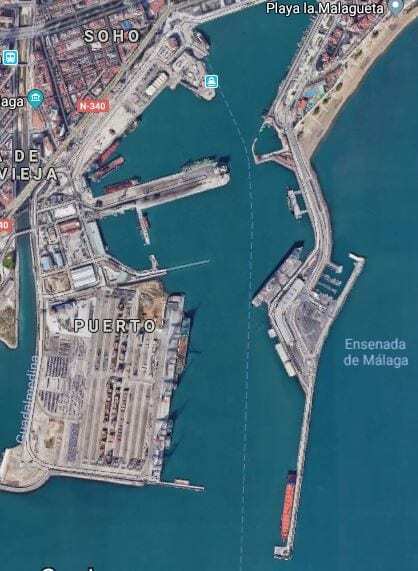 There is also an outer harbor, sheltered by a large breakwater and this is the oil and cargo port which is even larger than the inner port where we are docked. 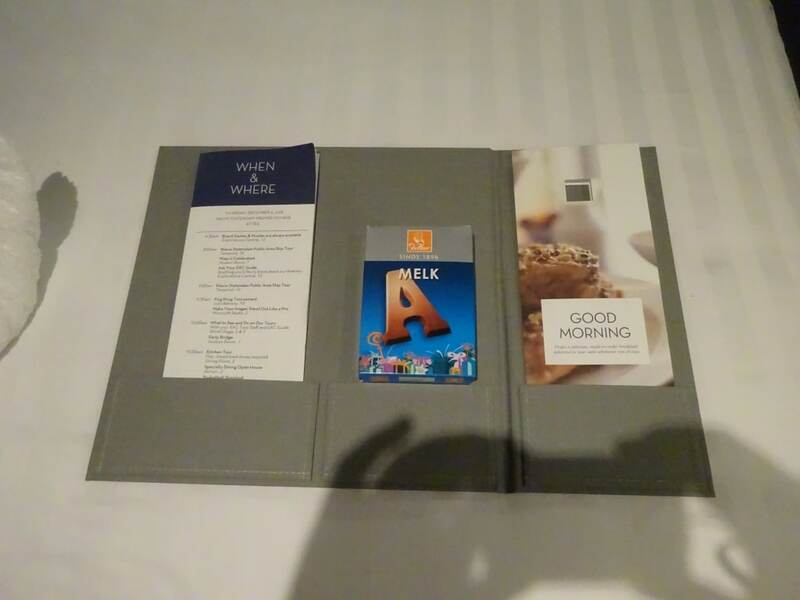 But this port is a very good port to be in and if Holland America would ever consider this a port for an overnight stay then you would not hear me complaining. Cartagena is totally different to Malaga where we will be tomorrow. Malaga has a very deep harbor but is also much more exposed to the elements. To protect the harbor they built a very long breakwater which doubles up as the cruise terminal. We are scheduled to dock all the way inside at the cruise terminal close to the city unless the Harbor master changes his mind. To get to Malaga we have to sail for a night along the Spanish coast, and we have to stay a considerable distance away from that coast. Much more than what is needed to get from A to B, via the shortest distance. A number of years ago there were a few near tanker & other ship collisions in this area, mainly caused by ships who tried to cut the corner as much as they could to save fuel. 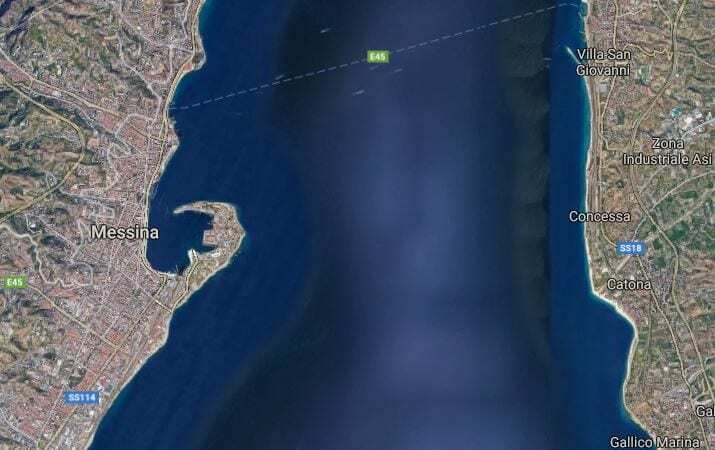 Spain was not in the mood to have their beautiful beaches polluted by this corner cutting so they moved the shipping routes completely offshore. There where there is ample room to stay clear of each other and if something would happen the authorities would have sufficient time to take action. To make sure that everybody follows this compulsory route, there is a VTS monitoring station that makes a lot of noise if you do not behave. Please note the blue dotted lines on the chart. That is the route we also have to follow, it is basically the regular route to Gibraltar. The Spanish Coast Guard is watching from a Radar Station close to San Jose at the cape and we are only allowed to leave the route once well clear of the corner. Long time ago in 2001 I was here with the old Noordam and we listened to a Chinese tanker being advised in Spanish that they were following the wrong course. Well Spanish is not high on the list of languages for Chinese citizens to learn so nothing happened. But also Spain has boats with guns on it, and it did not take long before a Coast Guard vessel came speeding out and went alongside this Chinese tanker. We were too far away to see if they really boarded but the Chinese must have gotten the message as my navigator advised me that the plot of the ship on the Radar screen was changing and the tanker was making a 90o turn to the south. Closely followed by the Spanish Coast Guard. We might not speak Spanish but we know the rules and thus we will be good boys (and girls as we also have a female navigator) and sail nicely along the dotted line until we reach Malaga early tomorrow morning. Weather for tomorrow: Very sunny with 66oF /19oF, no wind and 2% chance of rain in the afternoon. 06 December 2018: At Sea. We slipped through the Strait of Bonifacio early this morning and are now enjoying a glorious sunny day at sea. And it is a smooth sea; with a gentle to moderate breeze from the North East. Things are well in the world………… at least in our world. We are sailing on a straight South West course from the top of Sardinia down to the South East point of Spain and once there we will then follow the coast until we come to Cartagena pilot station. A pleasant surprise on my bed last evening after turn down service. Last night was the “Dutch Sinterklaas” celebration in the Netherlands. Santa Claus is derived from this children’s feast which the low Dutch immigrants brought with them in the 17th. and 18th century to the USA. With all the inaugural happenings going there was not much time to focus a little bit more on this very Dutch happening but those in the know got a Dutch chocolate letter in the cabin in the shape of the first letter of the first name. This instead of the regular good night chocolate. The ship will now settle down into it regular routine, step by step, but below decks there is still a lot of sorting out going on, mainly to get the spare parts to their correct location. When a ship is delivered it comes with a standard amount of spare parts. In the same way as a car has a spare tire. On top of that there are a lot of extra items ordered by the ships complement. Items needed to keep the ship operational. So everybody is still unpacking boxes and sorting out the right location so it can be found back when needed. Then there are the large lists of “little things to do”. Small things; and mainly things that make the operation go more smoothly and in accordance with the company standards and practices. As an example: during stand by the sailors wear helmets. This is compulsory and these helmets should be ready for use at all times and thus not removed from the mooring deck. Helmets need hooks to be hung on. But the shipyard does not install those hooks as it is not part of the new build specification. Thus the Deck machinist will weld those hooks on the forward and aft mooring decks. Once there, the Bo ‘sun will paint them against the rust and another task will be completed. And all those small tasks run into the hundreds. The Aft boiler room. We have two boilers one in the Forward an one in the Aft Engine spaces. Both boilers are vertical and go up three decks into the engine casing. The red part is the boiler front where the boiler is fired up. We use boilers to make steam. The man in the blue coverall is one of the engine ratings busy with cleaning up what the Yard did not clean up. At least did not clean up to HAL standards. I spent part of my day preparing for tomorrow’s Fire drill. It is compulsory to conduct a full emergency drill every seven days and we alternate the fire part between Engine spaces and Accommodation spaces. Last week I put the crew area on A deck forward on fire and now it will be the Aft Boiler Room. 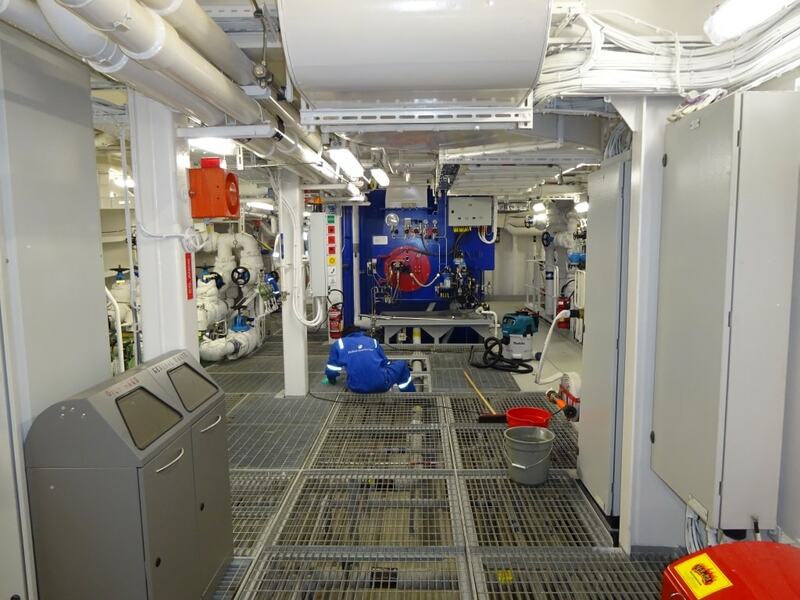 The engine room is the most dangerous space on board in case of a fire. There is a lot of combustible material and fuel around (one burst fuel pipe and it gets critical) and the routines are much different than outside the engine room. If there is a major fire in an Engine Space, and the High Fog (a sort of high pressure misting system) does not extinguish a fire straight away, then the Chief Engineer has only 10 minutes to make up his mind and to advise the Captain to release CO2. If that happens we lose power and that we like to prevent at all times. For that reason we also have two completely separate engine rooms; if one goes then we still have the other one, as each engine room has two main engines. Although we have high fog and CO2 suppression Fire teams with breathing apparatus still need to go in to assess where the cameras cannot see and remove casualties if present. Although the Aft boiler room is very spacious, fighting a fire here has its challenges. With fuel involved, the tactical approach is to drive the fire back so it can be completely covered with foam and thus smothered. But as the vertical boiler is round, there is the chance that the burning oil simply goes around the boiler and the flames appear at the other side again. The Box -Tree in the Atrium. I doubt if the designer of the original sculpture would have thought about the fact that within a few days his/her beautiful and artistic creation would be covered under wrapped up boxes. I had a question on the blog about if the Christmas decorations were going up? 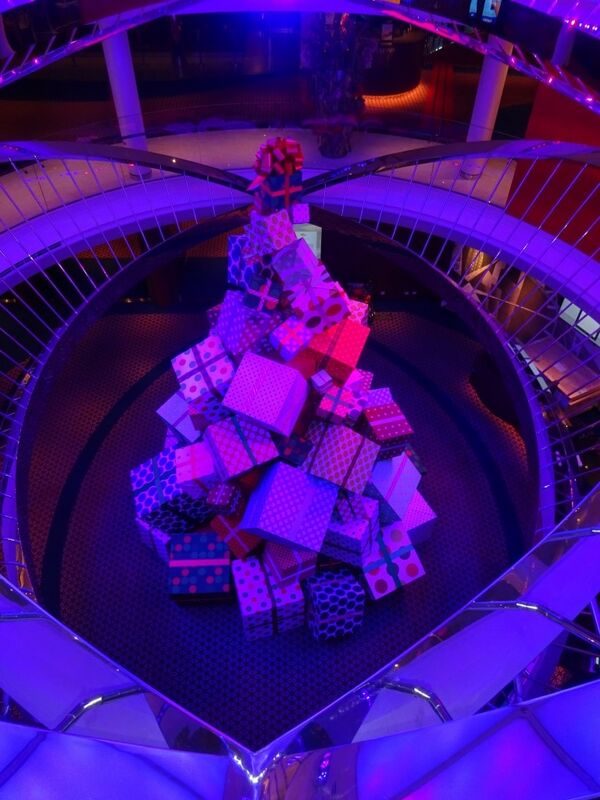 Well things are happening and our Atrium Deck 1 sculpture has disappeared under a pile of boxes to resemble a Box –Tree?? Yesterday a protective casing was built and these boxes were attached to that casing. In keeping with all the other – just different- art we now also have a -just different – Christmas tree. 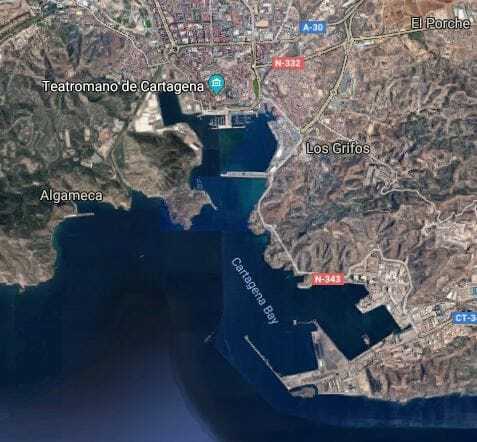 Tomorrow we are in Cartagena, South Spain and it is a very nice port where the Romans had already figured out that there were worse places in the world. Weather: sunny with temperatures or 68oF / 20oC and a1% chance of showers. 05 December 2018; Civitavecchia, Italy. This morning all the Shake-downers disembarked and the ship prepared for its revenue earning cruise. 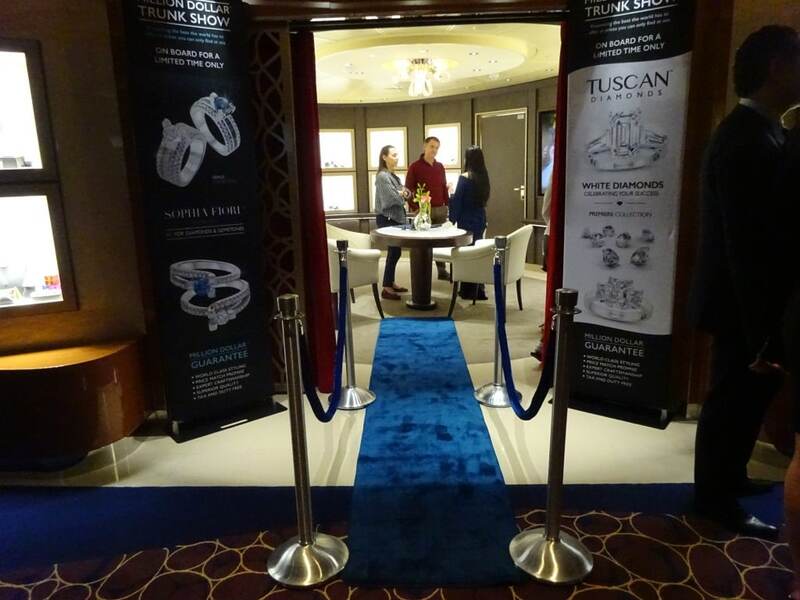 They hopefully had a nice cruise and the ship had a nice chance to test everything out, so we can give the coming guests the best possible service. We started to receive our first fare paying Holland America Line guests at 11.30 hrs. this morning; and we will start our first cruise. I have been thinking about “first” cruise. We have already done a shakedown cruise or preview cruise so is this really the real first cruise? I personally think it is as this is the first cruise where the ship is used for its intended purpose; e.g. 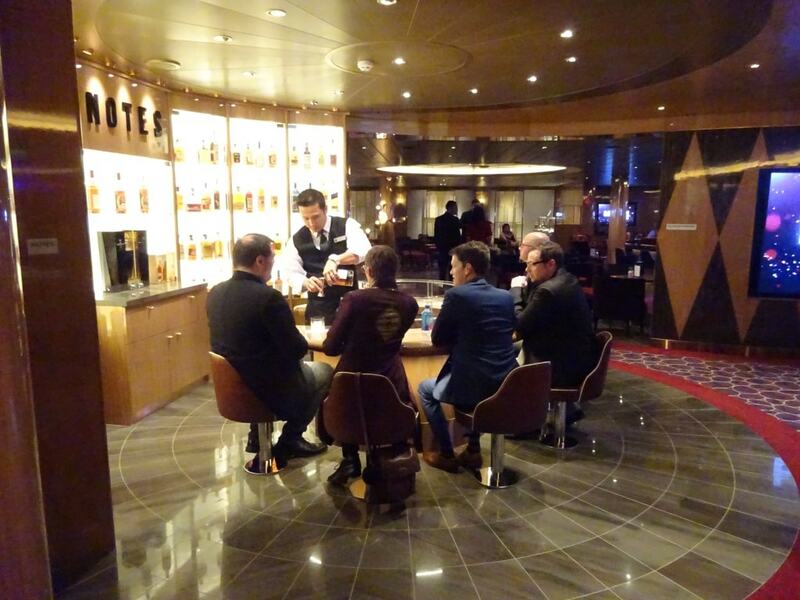 providing fare paying guests with a great (Holland America Line) experience. Pre view cruises or Shake down cruises or travel agents overnights/nowhere cruises or official /hand over trial trips have all happened in the past and sometimes long time in the past. The new ship was taken out to sea for one or more days to be shown off to relations of the company and/or to those who would be instrumental in helping the ship pay for itself. 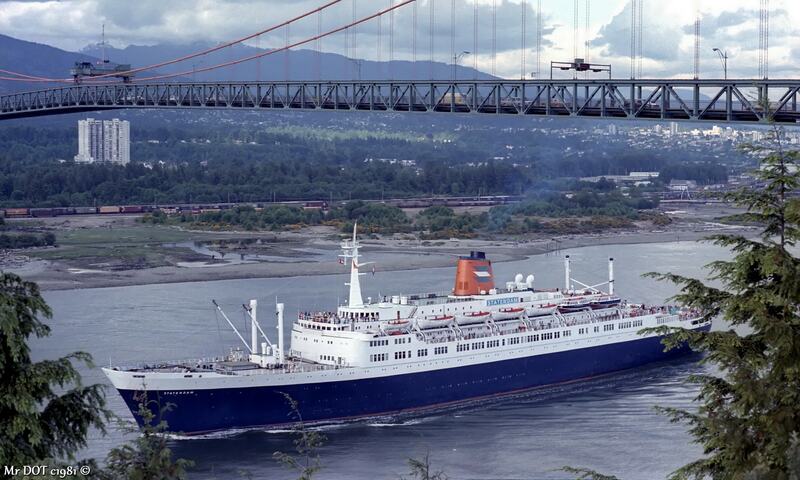 Then the ship would start on her maiden voyage. It saves a considerable number of miles by cutting through the islands, instead of sailing south of Sardinia. And thus we are starting today on our maiden voyage. We will be travelling from Civitavecchia and sail through Strait Bonifacius (just after midnight). 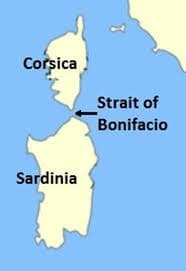 Bonifacius or Boniface is a fairly wide strait located between Corse (or Corsica) and Sardinia. It is quite scenic but on our route towards Cartagena we will pass through it during the night time. There are only small villages on either side so there is not much to see once it is dark. For a ship it is a good time to go through there as the local ferries are asleep and also are the large numbers of sailing boats who enjoy the strong winds here but without too much of the swell as there is good shelter under the coast. Once out we continue sailing south of the Balearic Islands into the West Mediterranean towards Cartagena. From there to Malaga, Funchal and then onwards to Fort Lauderdale. A bit reminiscent of the old Trans-Atlantic days when the maiden voyage would also be a voyage to the new world. We are not doing exactly what Holland America did in those days as we are sailing at a much lower latitude; to stay in the nice weather as we are a cruise ship and it is December. 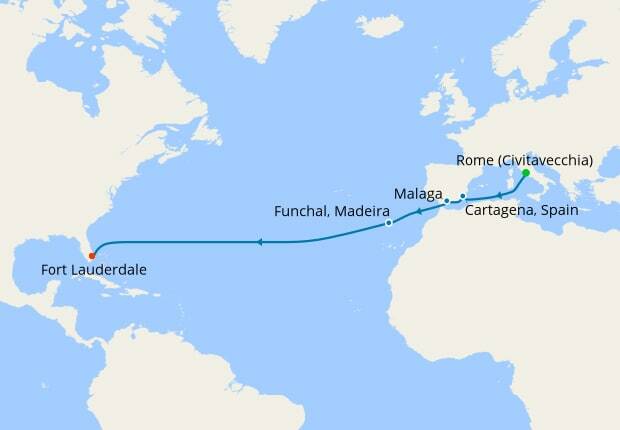 In the old Trans-Atlantic days this route was called the “Lido route” named so as in summer and in winter it had nice weather to sit outside. While on the North – North Atlantic route the passengers were huddled in deck chairs with thick blankets, bracing the weather, and looking forward to the 11 am. soup on deck. In those days the Lido route was monopolized by the Italian company’s sailing from Genoa and Naples. Famous names as the Conte de Savoia, the Rex and later on ships such as the Michelangelo and Raffaello made the route very popular and provided good weather until (in winter time) they were coming closer to New York. Our first cruise / maiden voyage to the New World. We will keep the sunshine option all the way as we are going to Florida. Hopefully we will stay in the good weather all the way as well. And the very long term forecast looks very good. I just did a 190 hrs. swell simulation on the internet (http://www.stormsurfing.com/cgi/display.cgi?a=natla_height) and it looks like we are going to skirt the high swells. I look most of the time at swell as that makes the ship move. A strong wind by itself is not much of an issue for a ship. It might make the ship lean but against that we can ballast and keep it straight up. Also swell only comes from bad weather so if you see the high wave & swell patterns you also know where the storm is; although the storm normally stays further north while the swell ripples down over a large area of the Atlantic Ocean. A ship such as the Nieuw Statendam only starts to move a bit when the swell goes well over 10 feet and it looks like……… if the weather patterns remain the same………….. that we might just touch the 12 feet. That is very good for December and thus I think we are going to have a very good crossing based on what I see now. So here we are, about to sail on our newest Holland America Ship the ms Nieuw Statendam and ready for an adventure of a life time. 14 glorious days to look forward to with a ship that visits a number of beautiful ports but which is also a destination in itself. Weather for tomorrow: Sunny with temperatures of around 15oC / 59oF. There is a disturbance building in the Golf of Lions south of Marseilles but we stay south of Ibiza and also we should out run it before it even becomes an issue. 04 December 2018; At Sea / Civitavecchia, Italy. We left Messina just before 20.00 hrs. and sailed out of the harbor with the city lit up as a Christmas tree against the mountain range to the West. From here it was northwards through Messina Strait and passing the Volcano Stromboli on our portside at 23.00 hrs. I did not see it as I was in the Main Stage to see the full performance of “Humanity” by The Dance Company, who had given a little taster show during the Hand Over Ceremonies on November 29. Now it was the full 50 minute show and it was impressive, very impressive. 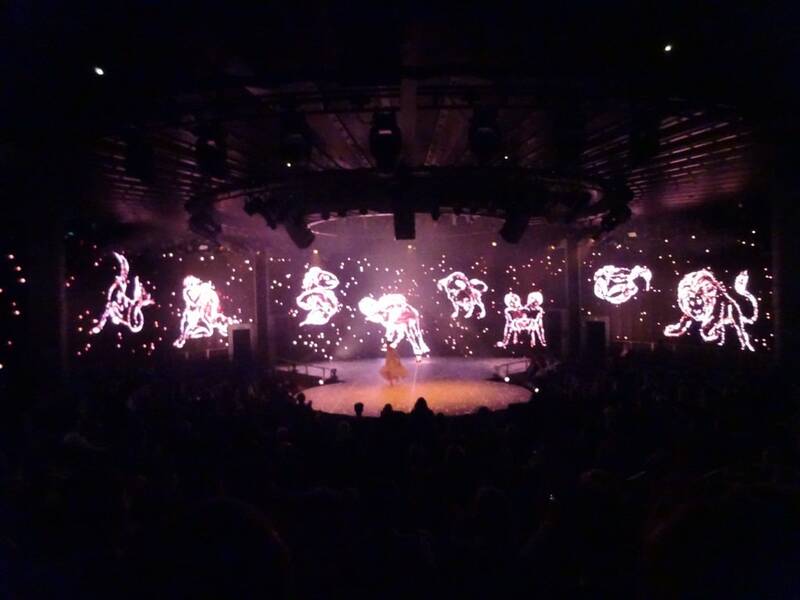 The LED wall of the Main Stage is even larger than on the Koningsdam and it was used to its full potential. 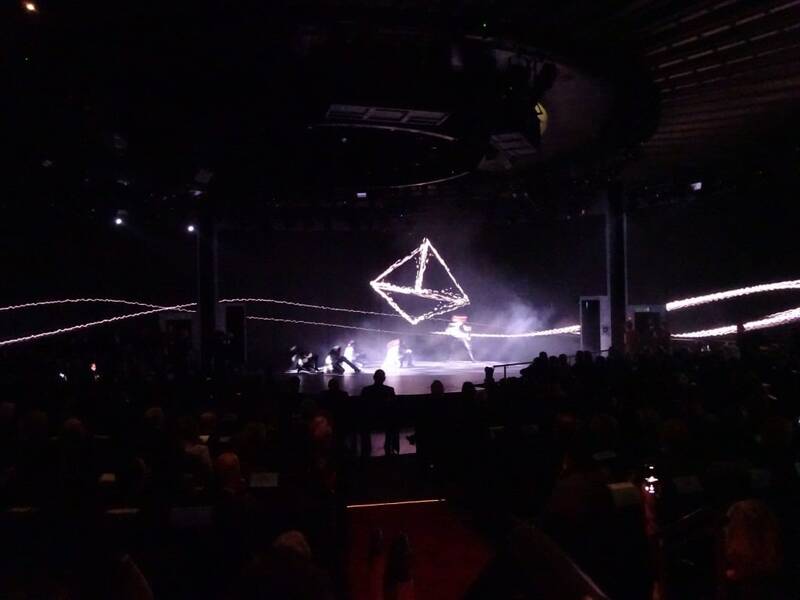 So the audience was mesmerized for the whole performance and thanked the performers (And in this case also the designers of Light, Sound and Choreography) with a standing ovation. If HAL can deliver a bit more of this, and I think they will, then the competition has to go back to the drawing Board to try to beat this. Dancer in front of an ever moving background that wraps 270o around the World Stage. Last night we had all the music venues in use. The Lincoln Art Center Orchestra, playing in the early evening, and then being relieved by The BB King Blues Band. Full House there. Further forward the “Dueling Pianos” of Billboard on Board who were alternating with the Rolling Stone Rock Room musicians; so there was no let down in the flow of entertainment all night. The Bar Tenders and waiters / waitresses were extremely happy with the sales as the last venue only closed at 04.00 in the morning. So thus far the Music Walk has been a resounding success. Full House at the Rolling Stone Rock Room (starboard side). Once these musicians go on a break, the musicians in the Billboard on Board (portside) take over so there is continuous entertainment. In real life things continued as well as we were very “nasty” by getting the late night / early morning revelers out of bed again by 10.15 hrs. for another Guest Boat drill. Well they are all on a free shakedown cruise, so if we need their help we will use them. Focus of this morning was to check on the assembling of everybody in the Muster Area’s and the proper mustering by using the Electronic devices, we call PDA’s. Using them omits the need of the cumbersome reading out of paper lists with all the dangers of miss-pronouncing guest’s names or them not reacting because they do not understand any English at all or think that they are in a different cabin. A bar code scan takes all those problems away. But the system depends on computers and software so we better do some in depth testing to get it right. And that is what we did this morning. More sedate but not less interesting, also a full house at the Notes. Tasting whiskies with the expert advice of the Bar Tender about what the difference is between single malt, double malt, blended and anything else what Scotland has invented in this area. The distance from Messina to Civitavecchia is only a night+ travel and thus we arrived here in the early afternoon. The early arrival gives those who have early flights tomorrow morning a chance to disembark and take an airport hotel for the night and the rest can enjoy an afternoon or evening ashore. Civitavecchia is not known for its vibrating night life but it has a nice boulevard with restaurants and one very good pizzeria. The Tirrenia Ferry with a Batman, Wonder Woman theme. Not exactly my idea of proper ship decoration. There was only one other cruise ship in port so we docked at the biggest terminal on the inside of the breakwater; the only one with a Jet Way for Guest Traffic. The port is very busy with cruise traffic in the summer but it dies down in the winter and then all the temporary Marques are taken down. Leaving one forlorn Cruise Terminal in the middle of the port but it works for us. 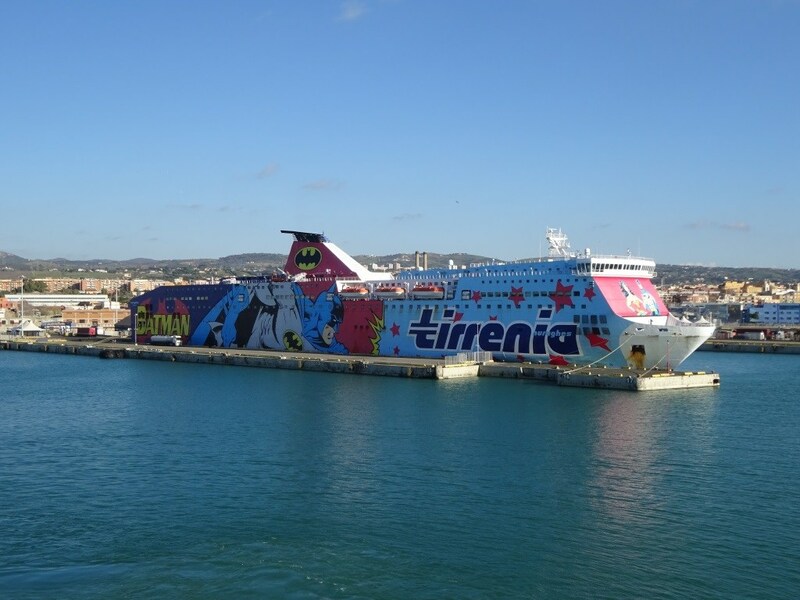 The ferry port continues to be busy all year around and the company “Tirrenia” is convinced that painting Marvel Comic figures on the outside of their ships will increase business. A bit puzzling to me, because when you travel on a ferry you see the inside except maybe the funnel. But maybe that is it. Having a selfie with a funnel with the Batman trade mark will do it. We are staying here over night and then our first official cruise starts. Very little change in the weather from today, so tomorrow it will be sunny and nice temperatures to enjoy. 03 December 2018; Messina, Sicily, Italy. I love Dubrovnik but Messina is so much easier for the guests as we dock right in front of the down town area. The port is the main ferry & access port to East Sicily from the Italian Main Land and thus there is heavy ferry traffic all day and all night long. Some of that traffic goes to docks south of Messina, some to the North and some into the port itself. The port is a natural curved harbor with an opening at the North side, sheltering all the docks from any waves and swell caused by the wind in the Messina strait. It also reduces the current here to a very faint .01 of a knot or so, while in the middle of Messina Strait it can run up to 5 knots. We will have that this evening when we sail to the North. Although there is not much tide in the whole Mediterranean (about 10 centimeters), there is a local phenomenon here. The small tides in the Med are semi diurnal, which means two high and two low waters in 24 hrs. But for a number of complicated reasons, they do not happen at the same time at the North and the South Side of the Island. They are almost in phase opposition. So with little tide there is still a lot of current as it is high water on one side and low water at the other side. Tonight at 18.37 hrs. it is low tide, which means it is high tide at the other side and thus full current. By the time we leave, 20.00 hrs. there will still be a lot of current left. Due to the current, the ferries do not sail in a straight line but drift across which makes it sometimes quite complicated to figure out what a ferry is exactly doing. Same goes for the other ships coming through. Their course might be 270o over the ground but they might be steering 260 or 255 or 250 to counter act sideways push of the current. But as this changes the angle of the ship when looking at it, it might look as if the ship is heading straight for your own ship but is set clearly free by the pushing current. The Strait of Messina from above. (Thank you Google earth) The port is sticking out as a crooked hook into the Strait. The buildings on “the hook” are mainly shipyards, a Navy compound and ferry docks. Thus when you move out of the current of the Messina Strait towards Messina Harbor you first battle the full current and then it gets less and less and thus the course you steer comes closer and closer again to the real course if and when there would have been no current. Luckily the current in the harbor is nearly zero and thus the Nieuw Statendam could sail straight in and swing around off the dock and come alongside, portside too, with the nose pointing to the outside. The captain had opted for swinging on arrival to make it easier and faster to sail on departure. The weather forecast was giving quite a bit of wind from the North West and then for Messina the question is “what is north west”? If is close to the North, then the wind will push into Messina harbor but if it is close to the West, nothing is coming in as the mountain range to the West shelters the port. After an extensive crew fire drill this morning, we had a full boat drill for all starboard side boats. There was no wind, nice in the shelter and all boats went down into the water for some exercising. Being just fresh from the shipyard means, that the crew needs some extra training to raise their comfort zone with handling the lifeboats. Lifeboats are meant to sail full with people and when they are empty they lay on the water as an empty walnut shell. To get the shell back in the blocks and back home again, the asst. commander / driver has to use the wind as his/her friend to drift back into position. And that takes a little bit of training and refreshing the driving skills. Tonight we sail at 20.00 hrs. and then tomorrow afternoon we will arrive in Civitavecchia. Some guests with early flights will leave the ship after arrival; the rest will enjoy a final night on board and then disembark the next morning. That will be our first turn over for the ship and by lunch the first guests ever will board the ship to sail with us for the Trans-Atlantic to Florida. We still have one more surprise for our “Shake down” guests on board. We are going to test the Guest Boat Drill one more time tomorrow to see if we have all down to routine now. 02 December 2018; Sailing the Adriatic Sea. And then we did not sail. During the startup procedures the Engineers discovered an anomaly which prohibited the Chief engineer from being satisfied with all the systems being reliable. And then we do not move until the situation has been safely resolved. The yard and sub-contractors experts were on board (that is why we have a shakedown cruise) and they embarked on an elaborate fact finding mission. In the shipping business, not unlike the Airline business, there tends to be a knock on effect and last night it was no different. All was resolved by 18.00 hrs. but that was a conflicting time with the departures of a Costa ship and a Royal Caribbean ship. And thus we had to wait until 19.30 hrs. That put the Captain in a quandary about what to do with the call at Dubrovnik. We could still go there but we would be arriving somewhere in the afternoon and that would cut the call very short. So after reviewing the situation and with the intent to still give those on board a port day, it was decided to call at Messina on the 3rd of December. And stay there from 10.00 hrs. until 20.00 hrs. Dubrovnik is a beautiful city but Messina is a convenient city in that way that while you need shuttlebuses in Dubrovnik, you can just cross the street to get into Messina. By 19.30 hrs. 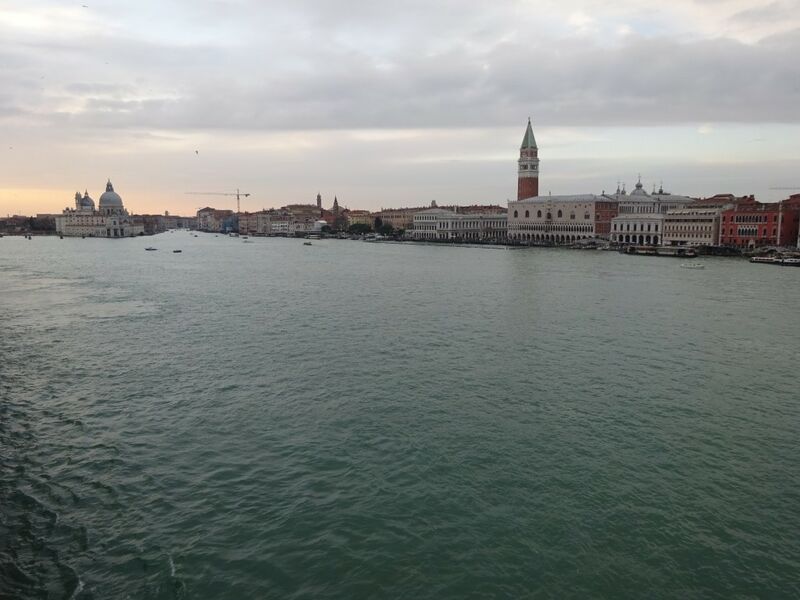 we sailed from the cruise terminal and through venice to the outside. Venice by night is as if you are driving through a fairytale with the lights shining on the old buildings but, while still impressive, I noticed a lot of lights out this time. I had heard that a lot of surface level installed flood lights had been damaged during the recent flooding’s and obviously they had not been replaced yet. Our route to Messina. On average we stay 12 miles off the coast until we come to the “Italian Heel” and turn West. So today we sail down the East Coast of Italy instead of hugging the west coast of former Yugoslavia. By 04.00 hrs. tomorrow we will be sailing along the Southside of Italy, the area that is called Calabria and then come up towards the Strait of Messina near breakfast time. The Pilot has been ordered for 09.00 hrs. And what was going on onboard last night? Well the place was heaving. We have on board 1762 guests (which includes a few hundred support staff) and 1041 working crew and 1 baby crew (not working). All the venues were open and everybody got a good work out in how to handle the large flow of traffic rippling through the Music Walk. Next cruise we should have more guests on board and so this shakedown cruise is a perfect test to see what works, how it works, what still needs to be done and what we can still improve upon. Today was the Grand Opening of the Shops on Board. Officially planned for yesterday afternoon, but you can not have a Grand Opening when you are not allowed to open because you are still alongside. 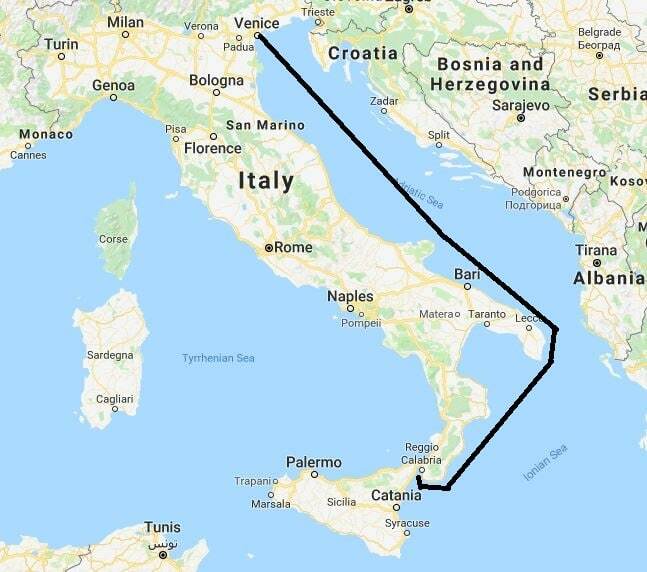 It would upset Italian Customs very much if we would try, even while we are paying 22% VAT over each sale as we are sailing in European Waters. The shops on board are a concession and we now have a new one Dufres which also operates Duty Free shops in airports. The official opening. The entrance to the Merabella shop which sells the really expensive items. All the familiar routines that we are used to are being implemented. 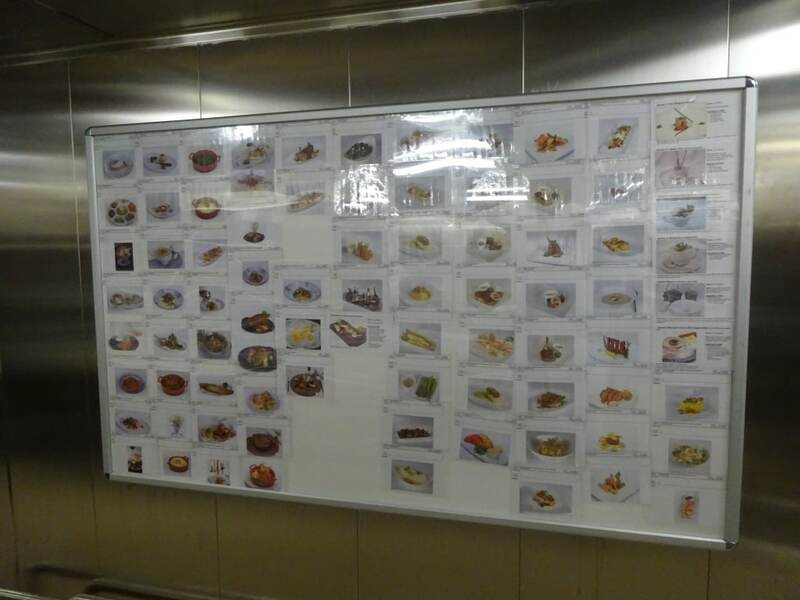 A few days ago the familiar wall boards in the Main Galley appeared, showing all the menu choices for the various restaurants on board. The pictures help the cooks to remember what the perfect presentation for each dish is as envisioned by the designers, the well-known chefs of the Holland America Line Culinary Council. These Boards are basically cook books for those who know how to cook but need a reference and have to make sure that the tomato ends up on the right side of the dish and not on the wrong side. The Display opposite the Pinnacle Galley. Looking at this wall is not good for your waist line as it conjures visions of going to make bookings in one of the Specialty Restaurants. Tomorrow we are in Messina and we are looking forward to a nice and sunny day. We are now much further to the south and thus the weather is getting absolutely balmy compared to Venice. 18oC or 64oF. The only thing that might mar a perfect day is increasing wind in the afternoon and that might mean choppy seas. Not ideal as we want to lower lifeboats for training. So it will all depend on the angle of the wind whether the Staff Captain has a happy day or not. 01 December 2018; Venice. Italy. Yesterday afternoon , sailing into Venice, as beautiful as ever. The weather is nicely following the forecast and thus we had a quiet but chilly night followed by a quiet but chilly day with a watery sun showing through. Not that it mattered much it as was not supposed to be a sunny Caribbean day but a European change over day. With the changeover being that we had the shakedown cruise guests coming on board. Some had arrived already last night but the majority joined this morning. A shakedown cruise is really meant to “shake down” the ship for a cruise. It was something that did not happen in the old days. The old Ocean Liners were simply completed and started sailing and that was it. Then in the 1990’s Holland America and every other company as well, started with one night travel agent cruises followed by what was then the maiden voyage. But the ships got more and more complicated and the service to the guests more and more refined. To such an extent that you could not just have crew walking on board and run a perfect cruise from scratch. Hence the shakedown cruise was invented. A short cruise to test everything and if it was not perfect than it did not matter as the guests on board did not pay but were there to help out with testing the perfect product. We tested that concept with the Koningsdam and it worked beautifully and hence we have continued this now with the Nieuw Statendam. These guests will enjoy a nice cruise but might be exposed to some testing of systems to see if it all works as it should. One of those guests is my lord and master who descended upon the ship last night after having indicated the desire for inspecting the Nieuw Statendam. And how am I to say No? I have learned better than that after 27years of marriage. I am not the only one as there are quite a few of past and present Holland America Line officers and crew members here, who must be in the same situation. The ships complement is already looking beyond the shakedown cruise, to December 5 when the first paying guests come on board. We are starting the regular cruise calendar for the ship with a Trans-Atlantic Crossing calling at Cartagena, Malaga and Funchal before heading straight for Fort Lauderdale. Once there the ship will settle down in a 7 day cruise routine although the first cruise will be a 3 day one, to get the ship into the regular routine of Saturday departures. In the meantime all the venues on board will be tested to the limit to see if it all works. Specialty restaurants, all the venues of the Music Walk, The Green House Spa, and all the behind the scene routines. No doubt Room Service will get a work out and the various Bars as well. 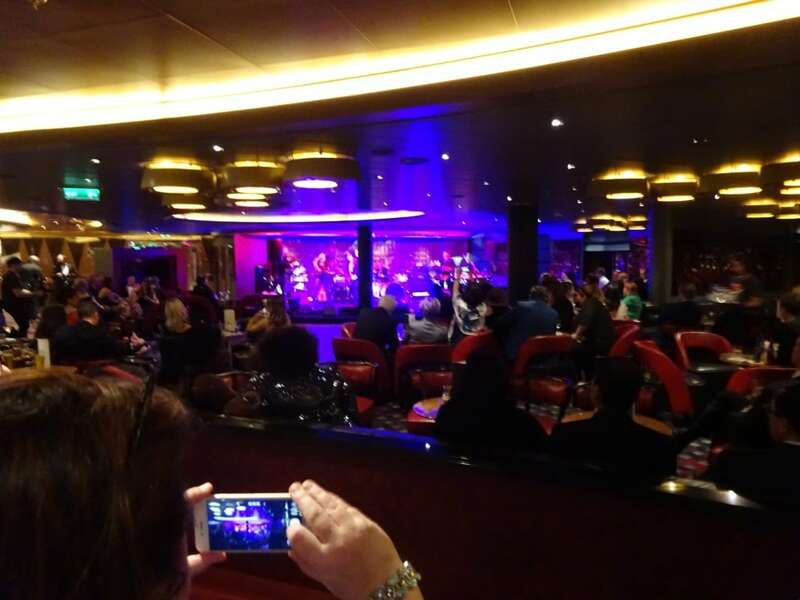 Some guests will have made Holland America cruises before so they will settle into their regular routine but there will be numerous who will have their first taste of a HAL cruise and they will want to taste and experience at all. Thus “Shake Down” here we come. The final piece of art installed. Simple and clean lines without any fuss. I promised one more piece of art, the final piece of art which was only installed the day before yesterday and only yesterday the supporting tape came off. For me it is one of the nicest pieces of art on board. I would call it a harp, although it is not one. It is simple, stylish and a proper focus point before entering the Music Walk. I mentioned in one of the previous blogs that we had 1920 pieces of art on board so it is too much to show them all on the blog. Time for everybody to book a cruise on the Nieuw Statendam and to see it for themselves. But one more unusual piece of art to savor. Standing outside the Tamarind Restaurant on Deck 10 we have 2 Chinese statues but again with a twist. The shapes are normal but the outside covering is different. Starboard side is pink, portside is blue. When they found the emporrers soldiers in China they said that each statue was copied of a real soldier. 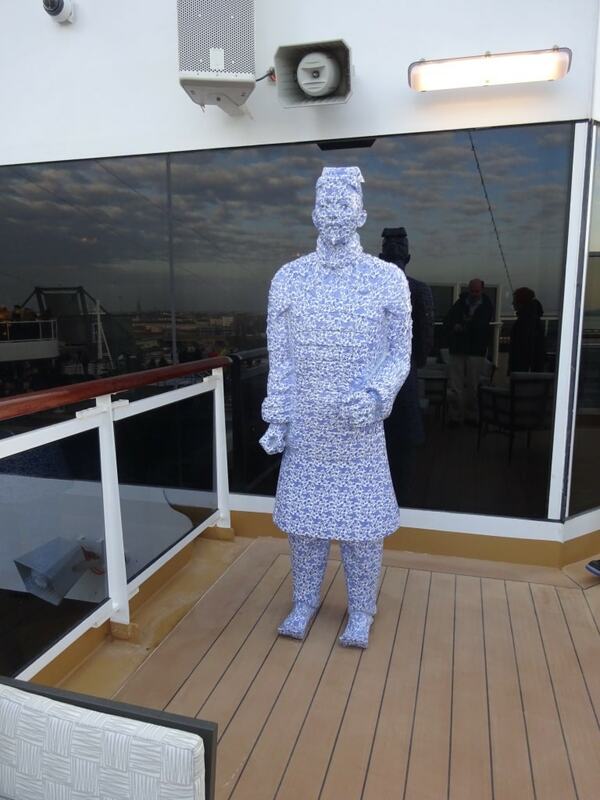 Now that soldier has made it all the way from China to the Nieuw Statendam with a new uniform as well. The weather for tomorrow should be the same as today. Partly sunny but chilly. We should spend the afternoon in Dubrovnik and from their sail for Civitavecchia. We have done our Guest Boat drill with all the “shake downers” going through the routine so we are ready to go. 30 November 2018; Nieuw Statendam, Marghera Italy. No more days to go, today was day zero and we sailed today. During the night the shipyard had cleared away all the impediments along the dock and we were just moored on our own mooring ropes and one gangway ashore. Before we could go there was still the minor detail of the Contract Signing. Same as when you buy a car, they like you to sign the contract before you drive off the Forecourt. So before we drove the ship out of the yard, something had to be signed as well. Hence there was a small ceremony in the Fincantieri yard office, we got the ship and they got the money. It is a bit of going “around the houses” when sailing from M. to V. but the lack of deep water channels through the mud flats leave no other option. Then by 11.30am we pulled out and sailed through the narrow channel to open sea. We had “time to say goodbye” playing on the P.A System, a tradition with Holland America that goes back to whenever the song was a hit for the first time, and we had to go slow as there was not much water under the keel hence it took 1 hrs. and 45 minutes to get to open water. Sailing from the shipyard is only scenic if you like the architecture of Industry. The pilot told me in 2016 that they put here the pipes as a bridge over a channel as it worked better than through the mud. There was a small chemical tanker waiting in the fairway for us to go by and then follow us out. Then it was with 16 knots to the north to the main entrance to Venice and we re-entered again at 15.14 hrs. We cannot take a short cut here, even with all the water as it is simply too shallow. The aim of the whole operation with departure and arrival time from Marghera to Venice is, to get alongside the dock before dark, so that we have a good view while sailing and docking for the first time. The Nieuw Statendam Townhall meeting with our President Mr. Orlando Ashford. In the meantime, inside the ship all sorts of things were happening as well. Our President Mr. Orlando Ashford held a Town Hall meeting with all the crew in the Main Stage. 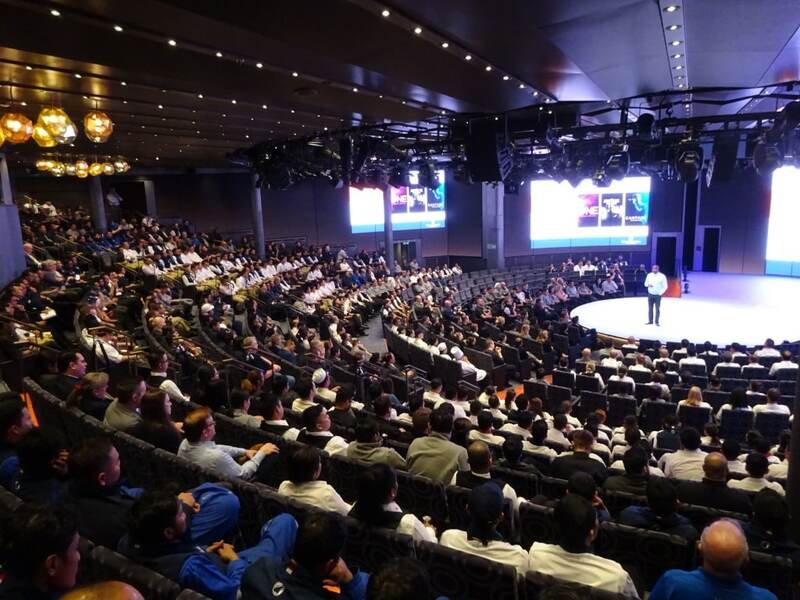 He has been doing this ever since he came to Holland America (Tomorrow he will be 4 years with the company to date) and he presented a multimedia show to give all the crew an impression what has happened to Holland America in the last four years. Most of our crew do not see the Press Releases or come above decks much to see all the changes to the product that we are delivering. A number of things that were introduced on the Koningsdam have proven so popular that they are now being retrofitted to the rest of the fleet. Profits are up, Crew pay is up, Crew contract length is down, it was a positive message he could bring. The crew really appreciates these sorts of meetings, as it reduces the distance between those in management and those on the ships, and ties shore side and ship side closer together. 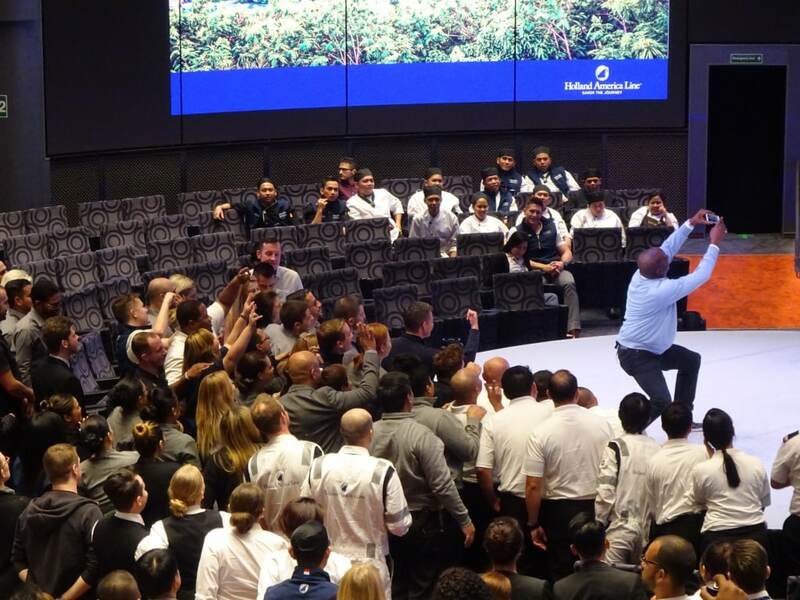 A try to make to take the biggest selfie ever on the high seas. Unfortunately the Main stage is round and that does not make it easy for a good selfie. On the Music Walk the entertainers were playing. Lincoln Art Centre gave their first official performance in the Queens Lounge, which is in the afternoon and early evening the performance location for the Classical Team and then later on it becomes the BB King Jazz Club. In the morning we have America’s Test kitchen there so it will be busy all day. 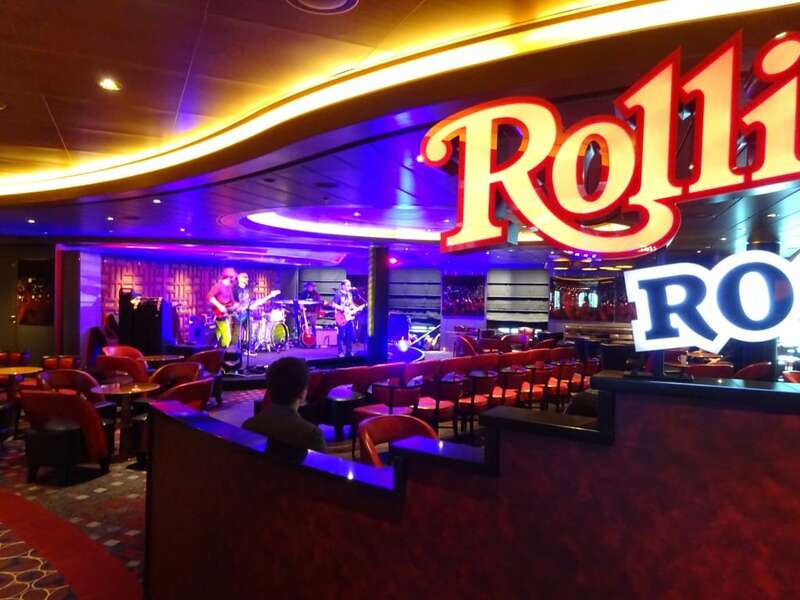 Also the Rolling Stone Rock Lounge Venue was rolling and the band was in full swing with Rock and Roll, at least I assume it was. I am from the 70’s / 80’s disco era and Rock and Roll has somehow passed me by. 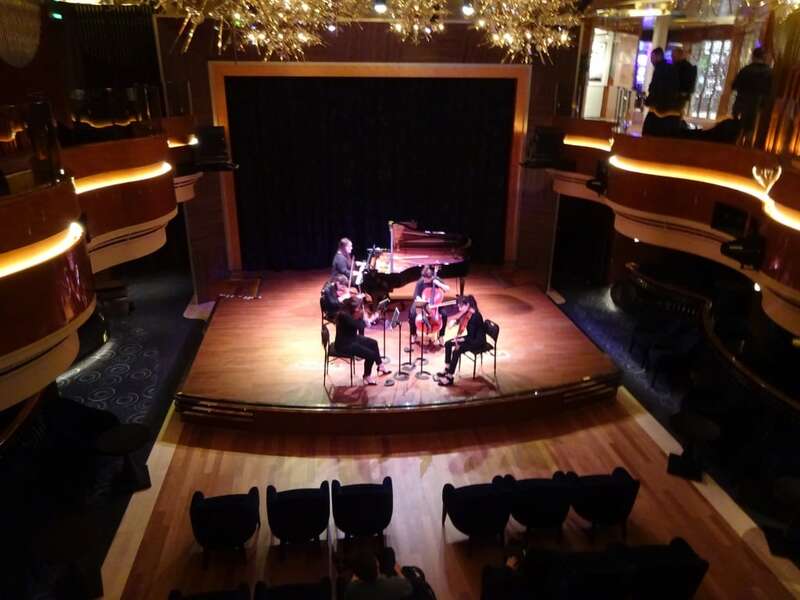 The First Ever official performance of the Lincoln Art Center group on the ship. We docked at 17.00 hrs. and because we were early we swung around and went stern in. This will make it easier to leave tomorrow as we can save some time by not having to swing off the cruise terminal. This evening we will start the embarkation of the first guests who are going to sail with us, although I have been given to understand that the majority will join tomorrow morning. And then the four day shakedown cruise will start and we can test if everything works as it should be and by the way it is going at the moment I do not think that it is going to be a problem. Another “official” first. the Rock band in the Rolling Stone Rock room. I had a question on the blog about the tonnage of the ship. 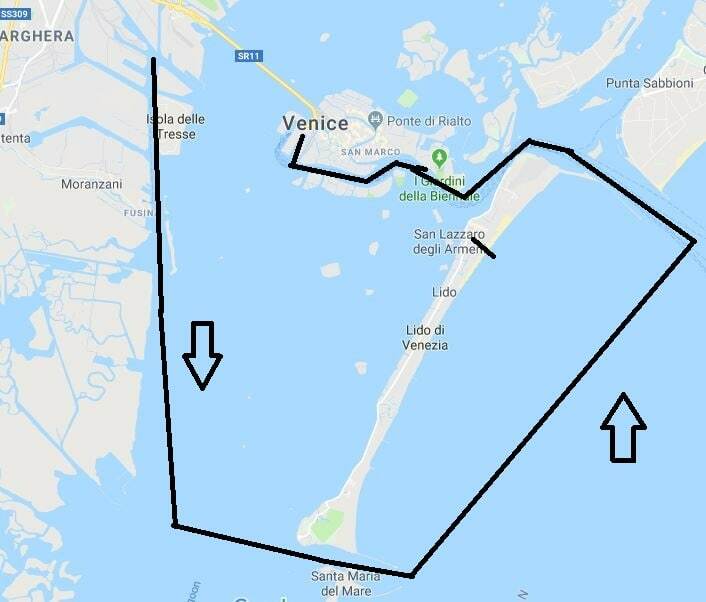 The Nieuw Statendam is now officially measured at 99,902 register tons (read volume tons) & a length of 985 ft. and that means that she falls just until the 100,000 tons limit of ships allowed to sail into Venice. That is one of the reasons that Holland America is not going for the big ships (100.000 tons and up to 3000 guests is nowadays a medium size ship) and otherwise we cannot offer the guests all the 480 ports our ships call at. 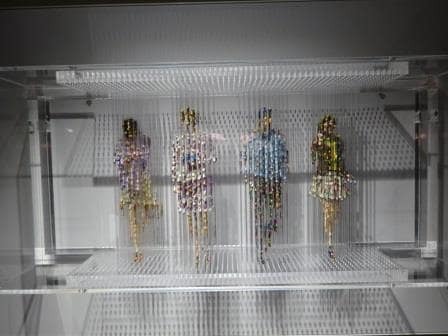 Four figures in a box. Far away you can see the figures and the dresses. When closer you can see that it are blobs of paint on steel spikes. Today the last piece of art was installed and I will post a picture of that tomorrow. Now two photos of something quite intricate, at least I think it must have taken the artist a long time to make it. 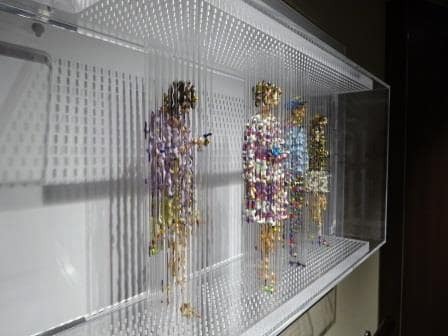 A display box hanging in the staircase with figures made out of vertical pins and paint blobs. Tomorrow is supposed to be a sunny day but chilly 9oC / 48oF. 29 November 2018; Nieuw Statendam Building, One Day to go. 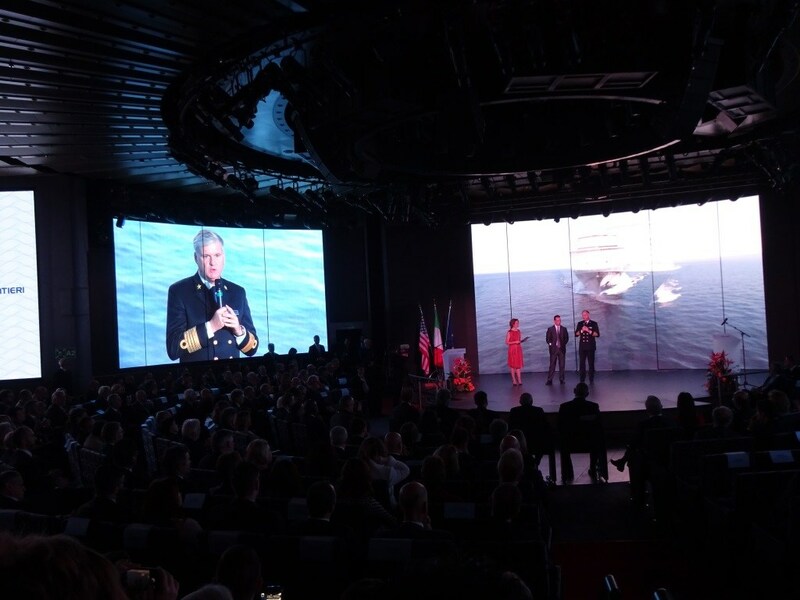 With one day to go, today it was the big day, as the ship was handed over by Fincantieri Shipyard to Holland America Line. The ship is more or less finished and thus there was very little work going on. We have on board 1043 crew who are on the crew list and we are expecting another 40 today. On top of that I estimate that we have approx. 200+ support staff on board, which includes a large number of trainers and quality control managers and such diverse groups as Public Relations and wine experts. In the coming days a lot of these people will leave the ship port by port but I believe that the President of HAL and some of the Vice Presidents are staying on board until into next cruise. Last night there was a cocktail party and subsequent dinner to say thank you to the new build teams of Carnival and Holland America Line. CCS (the new build team Carnival Corporation) oversees the whole operation as Carnival Corp is basically paying for the ship after which the Brand, Holland America Line is operating it. Holland America Line is supervising if it all gets installed according to specification and is then responsible to get the ship setup to HAL standards so we can sail and deliver the product. 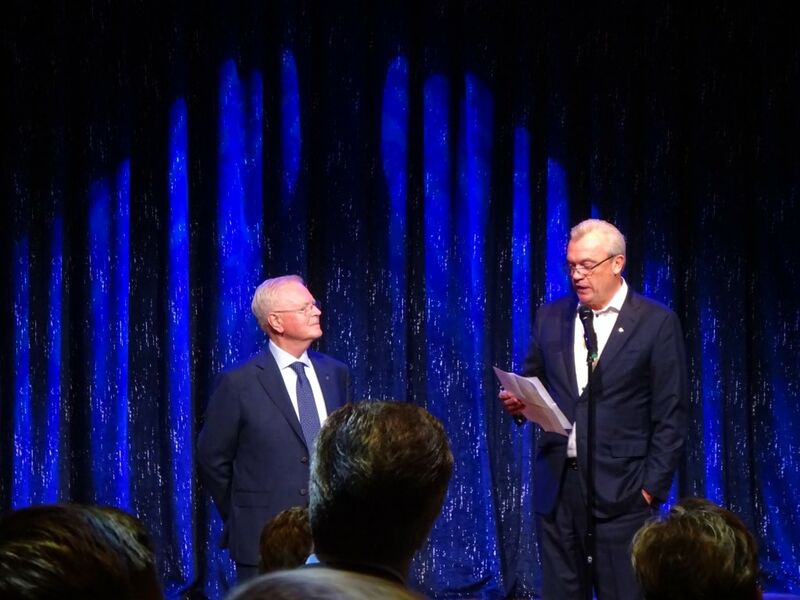 There were several speakers at the party, Keith Taylor, Orlando Ashford and Stein Kruse with thank you’s and observations but the most important occurrence was the recognition of our new build manager for the Nieuw Statendam. Mr. Jan Koller, Newbuild Manager and 50 years with Holland America Line. To the right Mr. Stein Kruse who needed notes as he went through Jan’s whole career and there were more Dam-ships to mention than he could remember. His name is Jan Koller and he is also this year 50 years with the company. And that is a long, long time and not many employees reach that number as either you have to start very young or stay with the company until well past retirement time. But Jan started young, in 1968 we still had cargo ships and his first one had the real Dutch name of Gorredyk. (Gorredijk is a town in the Netherlands and all the Holland America Line cargo ship names had a dyk ending) Jan went through the ranks, stayed on the fleet until he was an established Chief Engineer and then moved shore side when the newbuilding of the R class started. And he has been New build manager ever since. I know Jan since he was 2nd engineer on the new build of the old Noordam in 1993. Mr. Stein Kruse made a very nice speech and went through the whole career of Jan, which was by us all much appreciated because 50 years is a milestone. Jan has promised that he will also supervise the 3rd Pinnacle Class which comes into service in 2021. By that time he will have served the company for 53 years. Mr. Arnold Donald on behalf of Carnival Corporation. The handover ceremony was planned for 11.00 hrs. and by 09.30 a steady stream of invitees started to arrive. For that purpose the big tent on the dock side was used to check everybody in. Once on board they could go to the Main Stage where at the entrance Service Staff verified your name against a list on a tablet and then directed you to the correct seating area. Lots of shipyard security around but also some “suits” who were clearly special security and later on it became clear that they were attached to the Vice Minister of Italy for Transport and infrastructure. They must have thought the ship was really safe as they spent a lot of time focusing on the breakfast setup in the Lido. 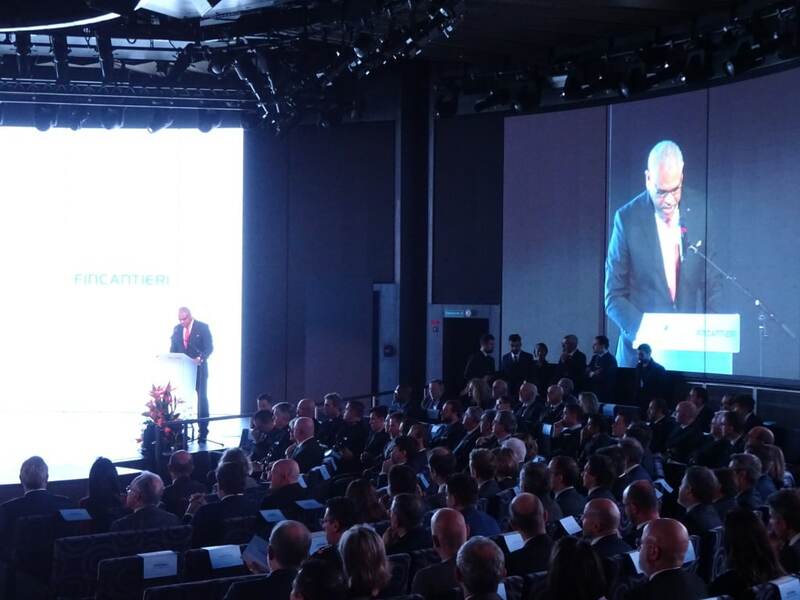 The Stage was set up with two stands, so Italian speakers spoke from the portside and company speakers in English spoke from the starboard side. The captain made a speech while standing in the middle and I thought that was very symbolic. It was not just about the High and the Mighty today; the crew was not forgotten and basically the ship is theirs tonight. The shops will be open for inspection, there will be games in the Casino and there will be two shows in the Main Stage performed by the cast who ended the handover ceremony this morning. The Dance and Light show performed at the end of the ceremonies. The company is called Humanity and they will perform for our crew tonight. Please note the light effects. With this wonderful stage the lights curve 270o around the audience. It is almost as if you are in the show itself. Tomorrow should be another sunny but chilly day with 7oC /45 oF but with some wind so it will be chilly again. As mentioned yesterday we should be sailing at 11 am. Paintings by Stephen Card. Used with permission of Holland America Line. 25 April 2019; At Sea. 24 April 2019: Haifa, Israel, 2nd day. 23 April 2019; Haifa, Israel, Day 1. 22 April 2019; Ashdod, Israel. 21 Apr. 2019: Suez Canal, Egypt.